Son of former (1987-89) Cardinals catcher Tony Peña, a member of the 1987 National League Champion squad...Played in the 2001 Little League World Series for the Bronx, N.Y. team...Attended Instituto Ibere...Resides in Boca Raton, Florida. Made his first Opening Day roster. Added to St. Louis' 40-man roster on March 28...Posted single-season highs in hits (27), runs (10), doubles (3), RBI (8) and walks (6)...Three of his six walks on the season were intentional walks...Started 30 games in 2018 (STL was 15-15); started 15 in previous four years of his MLB career...Appeared in 31 games (11 starts) after Yadier Molina returned from the disabled list on June 5... Started 17 games (STL was 9-8) when Molina was on DL, batted .242 (15-62, 2 HR)...Entered vs. LAD (9/14) on defense and threw out first runner of season...Scored twice vs. PIT (9/11), his first runs since 6/30 vs. ATL. Scored a career-high 10 runs...Recorded his first career bunt single 9/2 vs. CIN...Went 3-for-4 with his first Cardinals home run, a double and a career-high three runs scored vs. PHI (5/18), becoming 2nd father-son tandem (Tony) to each hit a home run in Cardinals history (Ed & Scott Spiezio)...Recorded three three-hit games, 13th-most by a National League catcher in 2018, accomplished all three in his first 22 games...Had back-to-back three-hit games (5/17-18), joining his father Tony (5/13-14/1988 w/STL) and was the first Cardinals catcher to do so since Yadier Molina (8/23-24/16)...Caught 14 innings on 5/6 vs. CHI, establishing his MLB game high. Caught 12+ innings less than a week later at SD (5/12)...Entered game defensively on 5/5 in the 9th following an injury to Yadier Molina...Batted .462 (6-13) with a home run and three runs scored in four games against the Phillies. Blasted two solo home runs at KC (6/13), joining teammate Welington Castillo (twice) as Orioles catchers who posted a multi-home run game... Hit safely in three consecutive games in which he recorded an at-bat... Batted .500 (5-10) in five games with Baltimore including two multi-hit games... Played in 51 games with Norfolk (AAA) and recorded seven three-hit games... Started four games at first base and played in a fifth after starting the game at catcher. Hit his first Major League home run on 6.2 vs. BOS (eighth inning off Noe Ramirez) ...Had a three game hitting streak from 6/2-7 in which he hit .455 (5-for-11) with one home run and two RBI...Caught 4-of-8 (50.0%) would-be base stealers and has caught 5-of-9 (55.6%) in his Major League career...Batted .246/.298/.377 (47-for-191) with 11 doubles, a triple, four home runs, and six RBI in 54 games with Triple-A Norfolk. Francisco made his Major League debut on May 20 against the Chicago White Sox, catching the final inning...Optioned back to Omaha on May 25...had a second stint with the Royals as a September call-up, but never appeared in a game...Threw out Chicago speedster Adam Eaton trying to steal second base in his inning behind the plate...Spent most of the season with Triple-A Omaha, where he hit .240 with 13 doubles, 27 homers and 61 RBI in 96 games...Tied for fourth in the Pacific Coast League with 27 homers, which were also tops among backstops...Hit 18 of his 27 roundtrippers before the All-Star break. Opened the year as the starting catcher at Binghamton (AA), before being promoted to Las Vegas (AAA) wherehe spent the remainder of the year...signed with the Royals as a Major League Free Agent on November 17, 2013... Threw out 30 percent of would-be base stealers (15-for-50) and allowed just two passed balls in 57 games withLas Vegas...batted .257 with 15 doubles, nine homers and a career-best .459 slugging percentage... Hit .300 (15-for-50) against left-handed pitching with four homers and 18 RBIs. Played in the Florida State League All-Star Game and went 1-2 with a runscored...Finished third in the FSL by throwing out 47 of 127 (37 percent) runners whotried to steal against him...For the season, he had 15 games with two hits and three contests with three hits...Had two games with four RBI, May 12th and July 15th, both against Palm Beach...Picked up a home run in three straight starts from July 11th-July 15th and was8-16 (.500) in those games...Slugged two home runs and drove in nine runs in 29 games for AguilasDibaenas in the Dominican Winter League. Named to the South Atlantic League (A) All-Star team. Played with the Mets Instructional League team in Port St. Lucie, FL...Also performed for the Mets Instructional League team in the DominicanRepublic. February 11, 2019 St. Louis Cardinals invited non-roster C Francisco Pena to spring training. January 12, 2019 Toros del Este placed C Francisco Pena on the reserve list. 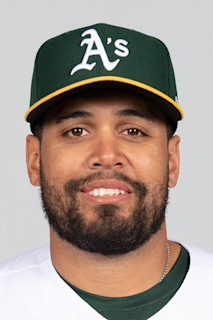 January 6, 2019 C Francisco Pena assigned to Memphis Redbirds. December 19, 2018 C Francisco Pena assigned to Toros del Este. November 2, 2018 C Francisco Pena elected free agency. November 1, 2018 St. Louis Cardinals sent C Francisco Pena outright to Memphis Redbirds. October 23, 2018 C Francisco Pena assigned to Aguilas Cibaenas. March 28, 2018 St. Louis Cardinals selected the contract of C Francisco Pena from Memphis Redbirds. February 23, 2018 St. Louis Cardinals invited non-roster C Francisco Pena to spring training. February 7, 2018 C Francisco Pena assigned to Memphis Redbirds. December 8, 2017 St. Louis Cardinals signed free agent C Francisco Pena to a minor league contract. October 2, 2017 C Francisco Pena elected free agency. June 13, 2017 Baltimore Orioles sent C Francisco Pena outright to Norfolk Tides. June 10, 2017 Baltimore Orioles designated C Francisco Pena for assignment. May 31, 2017 Baltimore Orioles selected the contract of C Francisco Pena from Norfolk Tides. May 23, 2017 Baltimore Orioles sent C Francisco Pena outright to Norfolk Tides. May 17, 2017 Baltimore Orioles designated C Francisco Pena for assignment. May 2, 2017 Baltimore Orioles selected the contract of C Francisco Pena from Norfolk Tides. February 15, 2017 C Francisco Pena assigned to Norfolk Tides. February 15, 2017 C Francisco Pena roster status changed by Baltimore Orioles. February 10, 2017 Baltimore Orioles designated C Francisco Pena for assignment. October 20, 2016 C Francisco Pena assigned to Aguilas Cibaenas. October 5, 2016 Baltimore Orioles activated C Francisco Pena. October 4, 2016 Baltimore Orioles reassigned C Francisco Pena to the minor leagues. August 20, 2016 Baltimore Orioles recalled C Francisco Pena from Norfolk Tides. June 30, 2016 Baltimore Orioles optioned C Francisco Pena to Norfolk Tides. May 31, 2016 Baltimore Orioles recalled Francisco Pena from Norfolk Tides. April 1, 2016 Baltimore Orioles optioned C Francisco Pena to Norfolk Tides. December 2, 2015 Kansas City Royals traded C Francisco Pena to Baltimore Orioles for cash. December 2, 2015 Kansas City Royals designated C Francisco Pena for assignment. November 2, 2015 Kansas City Royals activated C Francisco Pena. October 8, 2015 Kansas City Royals reassigned C Francisco Pena to the minor leagues. September 1, 2015 Kansas City Royals recalled C Francisco Pena from Omaha Storm Chasers. May 8, 2015 Kansas City Royals optioned C Francisco Pena to Omaha Storm Chasers. May 6, 2015 Kansas City Royals recalled Francisco Pena from Omaha Storm Chasers. March 23, 2015 Kansas City Royals optioned C Francisco Pena to Omaha Storm Chasers. January 28, 2015 C Francisco Pena assigned to Dominican Republic. October 30, 2014 Francisco Pena roster status changed by Kansas City Royals. September 30, 2014 Kansas City Royals reassigned C Francisco Pena to the minor leagues. September 1, 2014 Kansas City Royals recalled C Francisco Pena from Omaha Storm Chasers. June 8, 2014 Omaha Storm Chasers activated C Francisco Pena from the 7-day disabled list. June 3, 2014 Omaha Storm Chasers placed C Francisco Pena on the 7-day disabled list retroactive to June 1, 2014. May 25, 2014 Kansas City Royals optioned C Francisco Pena to Omaha Storm Chasers. May 20, 2014 Kansas City Royals recalled Francisco Pena from Omaha Storm Chasers. March 14, 2014 Kansas City Royals optioned C Francisco Pena to Omaha Storm Chasers. November 17, 2013 Kansas City Royals signed free agent Francisco Pena. November 4, 2013 C Francisco Pena elected free agency. October 18, 2013 C Francisco Pena assigned to Aguilas Cibaenas. May 18, 2013 C Francisco Pena assigned to Las Vegas 51s from Binghamton Mets. March 25, 2013 C Francisco Pena assigned to New York Mets. February 1, 2013 C Francisco Pena assigned to Dominican Republic. June 21, 2012 Francisco Pena assigned to Binghamton Mets from St. Lucie Mets. March 6, 2012 C Francisco Pena assigned to New York Mets. February 2, 2012 C Francisco Pena assigned to Dominican Republic. March 8, 2011 C Francisco Pena assigned to New York Mets. October 21, 2010 C Francisco Pena assigned to Aguilas Cibaenas. August 26, 2010 Francisco Pena assigned to St. Lucie Mets from GCL Mets. August 14, 2010 sent C Francisco Pena on a rehab assignment to GCL Mets. April 8, 2010 St. Lucie Mets placed C Francisco Pena on the 7-day disabled list. February 4, 2010 New York Mets invited non-roster C Francisco Pena to spring training. November 25, 2009 Francisco Pena assigned to Aguilas Cibaenas. October 16, 2009 C Francisco Pena assigned to Aguilas Cibaenas. April 9, 2009 C Francisco Pena assigned to St. Lucie Mets from Savannah Sand Gnats.